made this cute simple rainbow theme design! *comes with extra art by @/stormcat ! Please note me your PayPal and I’ll send an invoice! may i ask when you may close this? 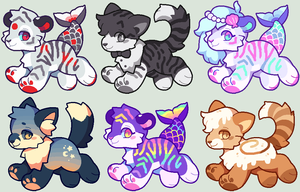 i could offer kitten for them if u wanted ♥ if not i understand i jst thought id offer ;w; good luck on offers otherwise ! $50 and 2 pieces of art! AAAA I LOVE IT SO MUCH !!! includes citykings, aliensphynx, w00my, and other designs! [OPEN] HQ Chara Purge!citykings, aliensphynx, etc! THIS IS SO CREATIVE OMG?? so cute! reminds me of carebears <3! an absolute dreamie shes so gorgeous !!!!!!!! !